I think it must still be cold because this has been soup week. Did you see Krista's Monday post? Yum!!!!! I've wanted soup all month. That's why I shared a shrimp soup recipe a few weeks ago. Slowly, deliberately, I removed the top (trying to imprint in my brain which way the spout went) and started the recipe. Needless to say, my husband was giggling behind my back, so of course I was having vindictive thoughts about not giving him a taste of my soup! (Cue: wicked laughter). But in the end, I made the soup, I gave my husband a taste, and found out I had a great soup on my hands...I mean, in my kitchen. Bring a large pot of water to a boil with 1 tablespoon salt. At the same time fill a 3- to 4-quart bowl with ice water. While water is heating, cut the potatoes into quarters. Add the basil leaves to the boiling water. Cook for 15 seconds. NO MORE. Remove the basil with a slotted spoon and plunge the leaves into the ice water. This SETS the bright green color. Drain and set the leaves aside. DO NOT pour off the boiling water. Add cut potatoes to the same pot of boiling water and bring to a boil. Cook for 20-25 minutes until tender. [A fork should slide easily in and out.] Drain well. Return the potatoes to the pot and cover, heat off. 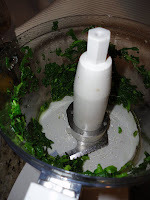 Meanwhile, place the basil in a food processor and puree. In a small saucepan over medium heat, warm the half-and-half and cheese until it simmers. Add the hot cream to the basil. With a handheld mixer, beat the hot potatoes in the pot until they are broken up. [You can also use a masher or drop them in the Cuisinart and return them to the pot afterwards.] Slowly add the basil cream, salt, pepper, then beat until smooth. Pour into 6 serving bowls and sprinkle with extra Parmesan cheese. And sign up for the mailing list to get in on the next contest...coming every two weeks as I approach the launch of L&F in May. Latest winners include: Mary B. and Caitlyn H. Congrats! I love potato soup and wanted to try something different. This looks delicious, Avery! And...too funny about the Cuisinart! We know a lot by instinct, don't we? I am in love with potato soup! BTW... I am about 20% with bleeding knuckles when I use my box grater... never bleed when using my processor. Ha! I'm a boxed grater girl, too, and big on my handheld mixer. (I'm so glad your recipe gives me that option!) Soup is wonderful, isn't it? Cream soups are so filling, rich, and satisfying, and I love that you can lighten them up by using lower fat milk, etc. So three cheers for soup AND Avery! Congrats again on your Agatha nom for Best First Novel! Woot! Dave (Year on the Grill), 20% bleeding knuckles. Oh, I know that feeling, too. BTW, everyone, Dave blogged about my cheddar muffins and Celiac disease on Year on the Grill and he did a great job!! He added more corn. Check it out. Cleo, thanks so much for the cheers and woot! I love how supportive our group is. We're so lucky. I am definitely trying this one! I love basil and try to keep a plant alive inside during the winter. I love my Cuisinart, but I also have my grandmother's box grater and I think of cooking with her every time I use it. Ah, Harbingerdc: I love that about your grandmother! Sweet. This is great!! Love the idea of using the potatoes as a side dish *or* turning it into soup. How fun! I have a food processor now (after many years of longing) and I find that I'm so used to doing everything by hand that I forget to use it! Thanks for the reminder. And --whoop, whoop, whoop on the Agatha Nom!!! What a lovely combination of ingredients -- potato, basil and Parmesan. Yum! I love Yukon Golds. They my favorite for mashing, and I bet they're very good here. Julie, thank you for the whoops! :) It was fun with this recipe to find it could be two things by just removing one. Krista, you've posted twice, so I guess you really do like it! LOL Yukon golds are so good they can be eaten without any butter at all. I am a soup's addict and this one seems so good, I'll definitely try it. Congratulations for your nomination Avery ! I'm with you on Cuisinart-phobia...I think it is all the various tools etc.!! I take your success as a personal challenge to get mine out and make soup! Our local "little market" (as opposed to our big market i.e. superstore) purchases all of their produce from the famous Eastern Market in Detroit. So their fruit and veg selections vary day by day, week by week. Well, there must have been a blockbuster sale on Yukon Golds because I was able to get a bunch for .99 cents/pound!! So your timing is impeccable :-) Soup and Margarita Pie for Chez Phillipe this weekend! Danielle~ Thank you so much!